5:25 am Monday morning: I woke to screeching tires followed by a loud crash! Startled, I jumped out of bed and stumbled to the window to see what had happened. Right about that time, Brian emerged from the closet where he had been studying and said the electricity had gone out! Sirens soon wailed through the frigid air. I couldn’t see much of what was happening so I snuggled back under the covers and dozed, being awakened by each new development outside – more sirens, bull horns, helicopter noise over head and whistles blowing to direct traffic. 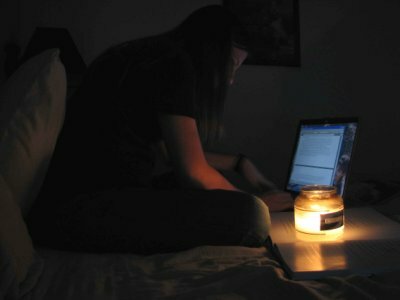 Finally finding it useless to lay in bed any more, I got up and helped Brian get ready for work – by candlelight. 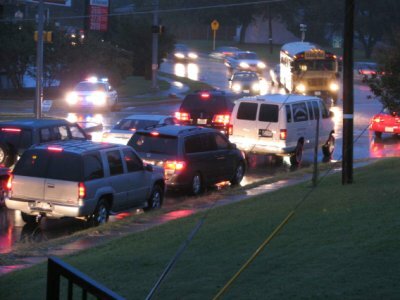 A Police car in the upper left corner blocks off the street while commuters rush to work. I felt sorry for the Policeman directing traffic that had to stand in cold, blowing rain. 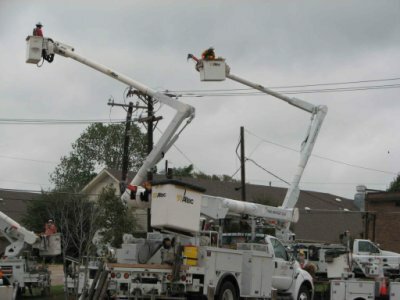 As it got lighter outside the problem became apparent – something major had happened to a utility pole. 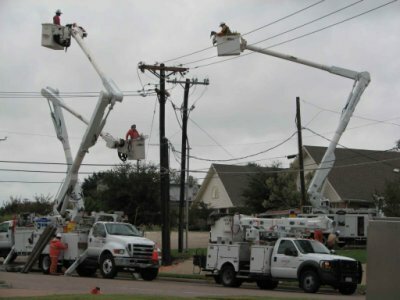 Over the course of the day, a dozen power company trucks gathered to work on the problem. I finally got curious enough to run across the street and ask what happened – a car had crashed into and broken the pole, making it necessary to install a new one and move all the wires from one to the other. This apparently was a complicated procedure. The people in the block aross the street from us didn’t get power until 3:00 that afternoon! Now, this may be a typical day in the big city, but it was quite the event to me! Coming from the country to a small town to Dallas has been full of interesting experiences. That, and the story doesn’t end just there – yesterday afternoon, about the time Brian should be coming home, I heard another noise outside as the lights went out in the house. Rushing to the window again, I was just in time to see several power lines (from the same place) slide off the back end of an 18-wheeler that had caught them on the top of his truck. Many of the apartments residents came out to watch the progress, shaking their heads in disbelief. The whole event wasn’t too bad for me though, I couldn’t cook any dinner so Brian took me out on a date! I’ll have to write the power company a thank you note.